Martin O'Malley plans to announce his presidential intentions on May 30 in Baltimore, a move that could present another Democratic challenger to Hillary Rodham Clinton. The former Maryland governor will hold a conference call with top supporters on Thursday night to discuss his plans for the announcement in his adopted hometown, where he served as mayor, an O'Malley aide said Thursday. The aide spoke on condition of anonymity to discuss internal planning and was not authorized to speak publicly. O'Malley, who completed his second term as governor earlier this year, has been considering a potential challenge to Clinton, the leading Democratic contender, and made repeated trips to the early voting states of Iowa, New Hampshire and South Carolina. He has cast himself as a champion of progressive causes during his time as governor and appealed to liberal voters within the party who are hesitant to support Clinton. "My timeline for awhile has been by the end of May and that remains my timeline. So stay tuned," O'Malley told reporters Wednesday in New Hampshire, home of the nation's first presidential primary. O'Malley's plans were first reported by The Washington Post. Staging the announcement in Baltimore could carry risk. 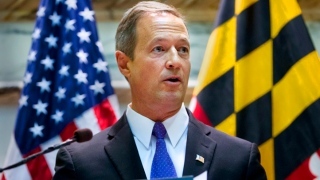 O'Malley's record as Baltimore's mayor a decade ago has faced scrutiny since rioting broke out in the city following the death of 25-year-old Freddie Gray in police custody. O'Malley has defended his work to curb violent crime in the city and signaled it would play a leading role in his campaign if he enters the presidential race. O'Malley remains largely unknown on the national scene but has offered glimpses of what his campaign agenda might look like, emphasizing that he would focus heavily on economic inequality, campaign finance reform and a foreign policy focused on national security threats and creating new global alliances. In a field dominated by Clinton, the 52-year-old O'Malley has sought to present himself as a fresh face representing a new generation of leadership. "I've been struck by the number of people who say to me, repeatedly, two phrases, 'new leadership' and 'getting things done,'" O'Malley said in Manchester, New Hampshire. If O'Malley enters the race with Clinton, as expected, he will join Vermont Sen. Bernie Sanders, an independent, who has courted liberal voters in the party. Former Rhode Island Gov. Lincoln Chafee and former Virginia Sen. Jim Webb also might run. Each of the Democrats looking to challenge Clinton is hoping to become a viable alternative for a segment of Democrats who want a competitive primary. O'Malley has been building out his staff in his political action committee and a film crew followed him during stops in New Hampshire, steps that would precede a presidential campaign.